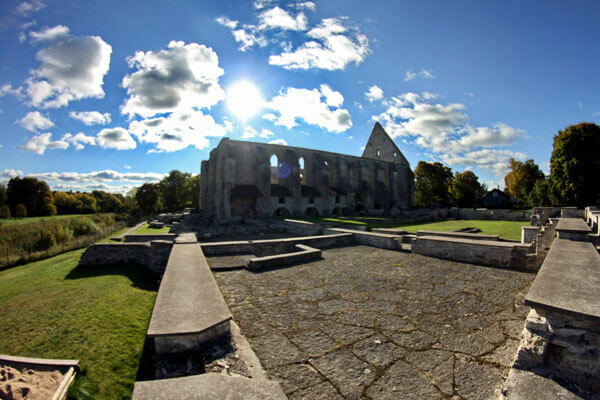 The beautiful ruins of St Bridget’s Medieval Convent have stood on the bank of the river Pirita for over 4 centuries now. It was founded in 1407 by the merchants of Tallinn and belonged to the Bridgettine Order. In 1577, during the Livonian War, St Bridget’s was destroyed by the army of Ivan the Terrible. Outwardly the convent did not look anything special: just another typical sacred building made in the late-Gothic style. Originally it was a wooden structure which later, in the early 15th century, was replaced with a brick one. It was finished and consecrated in 1436. The convent was unique because it housed not only monks, but nuns as well, however, their paths never crossed. Men’s and women’s parts of the building were separated by two yards. The southern part of the building belonged to men, and the northern one − to women. During divine worship, men and women never met as well. Today you may see some pieces of the convent, which were able to survive until the present: towering Gothic gable and walls of the main hall, some surrounding foundations, cellars, and a territory which was used as a graveyard. Modern Estonians have found a use for these ruins. Destroyed fortification and church walls today serve as decoration for arranging summer concerts and a yearly celebration of Convent’s Day. These ruins are the favorite place for summer concerts. A nunnery of the Bridgettine Order was built near the ruins in 2001. By the nunnery there is now a guesthouse that gladly welcomes everyone.